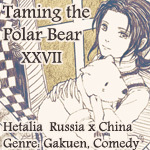 First anniversary of Taming the Polar Bear~! I published the first chapter on Fanfiction.net on 21 April 2010! I'm a couple of days late XDDD But this calls for a celebration! I will publish two more chapters after this over the weekend. Look forward to them! Yosh!